Compiled in the late 13th century at the Benedictine Abbey of St Benet at Hulme, Norfolk, this collection of chronicles begins with Geoffrey of Monmouth's bestselling 'History of the Kings of Britain'. It fills out Geoffrey's imaginative account of the Britons from their origins until the coming of the Saxons with a description of Britain, chronicles from the birth of Christ and the first Saxon kings to contemporary times, and a list of Benedictine monasteries in Canterbury. Between the 14th and 16th centuries, it belonged to Hickling Priory. The annals from the birth of Christ to 1294 end on this page. 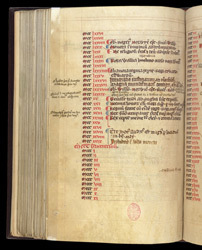 An entry on the birth of King Edward II, whose name is highlighted with red, can be seen following the date 1284 (mcclxxxiiii, in Roman numerals).